I snuck this in the Knebworth thread but have had no answer. Wondering if anyone knows where it came from please? 20/20 (or a similar US TV program) aired a profile on the BB's upcoming 20th anniversary year. That's what this footage is from. The entire show has circulated among collectors for decades. On another Youtube clip Al and Bruce talk about recording a live album in Cleveland in 1982. Did this recording take place and, if so, why wasn't it released? One song did - "Runaway", on the 1986 Sunkist album. That infamous medley...gotta love Stars On 45!! About that medley: I've never understood why they bothered to add (or rather the early 80s equivalent to copy/paste) extra handclaps to the portion of "I Get Around". Granted, a lot more could be questioned regarding the medley. Al wearing white shorts and shoes with black socks. Was he single then or did his wife just want him to look like a dork? Did anyone on stage or in the organization not have a....eh....queer eye to offer some advice? In Al's defense (which I am not sure is totally possible in this case), I think he is wearing red socks to match his red shirt. The best part was that Sunkist was the official sponsor of one of the 1986 tours! "Ladies and gentlemen, SUNKIST proudly presents from Southern California: America's Band, THE BEACH BOYS!" - Audio proof from a York, PA show in 1986. Oh, you'd BETTER believe it. 1967-74 Brian and Al are easily confused but Brian stops mid song and says I don't want to sing this sh-t. If you listen closely, Brian(?) says "keep going Al". Just Brian saying it during his vocal take. Somewhere in my collection I have a Sunkist T.V. commercial with a rip off band doing a badly reworked version of Good Vibrations. I can't figure out if they are being serious, or doing a parody. so..... where can I hear the tune "Walkin"
I feel like it's on a BB/BW doc....I'm thinking the A&E Bio to Brian Wilson. Gym Class Heroes did yet another crappy cover of it for a new Sunkist commercial a couple years ago. Awesome, this is a good thread. On the That's Not Me session highlights from the Pet Sounds box, what are they singing in the background towards the end of the track? I can't make out what they're saying. Aaand that's probably why I couldn't understand it Thanks for bringing the thread to my attention, I don't remember seeing it before. On the cover of the new(ish, from last year) Capitol Pet Sounds vinyl reissues, why are Sloop John B. and Caroline No taken out of the regular order of the track listing and placed at the top? They're also in white while the rest are in yellow. Not that it matters at all, I'm just curious as to why they've been put in front. 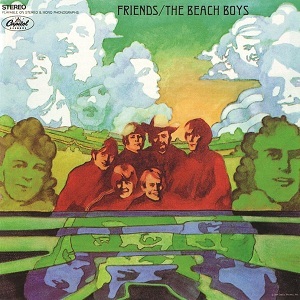 That's how they appeared on the original 1966 covers. And I think the reasoning for that was that they were the two singles released prior to the album's release. I have a question about I Just Wasn't Made For These Times(the song). It's probably something that a lot of people here know, but it's just something that has bugged me. When Brian sings "sometimes I feel very sad", what is Mike(?) singing at the same time underneath Brian? I've never been able to make it out. Aren't those vocals the Spanish lyrics Brian forgot about? "O cuándo seré... un dia seré..."
Brian was using Spanish during the recording of Pet Sounds for some reason... during the tracking of one song, I can't remember which, he calls for 'Take Eight... Ocho... Eight'. Didn't he learn some at school or something? Anyway, the vocals are there in IJWMFTT. But by the time the Pet Sounds box set and stereo mix was released in 1996 he'd forgotten all about them. If I remember the story correctly, someone asked him why he'd put Spanish BVs on that track, and he said 'WHAT Spanish vocals? There aren't any!' So they played him the isolated vocals and he was absolutely, completely surprised. I seem to recall he said something like 'Well I'll be damned'.